Several years ago I worked on a research project for a major U.S. newspaper. One outcome was this: not everybody wanted to pay for the whole paper. They’d rather spend a quarter for Sports than 50 cents for everything. The same can be said about cable TV. Not everybody wants 500 channels. Not everybody wants to subscribe to a series of premium channels when all they want is one. SyncTV is seeking to break the current business model where single programs can be bought at iTunes or Amazon Unbox for $2 or streamed for free from ad-supported network sites. 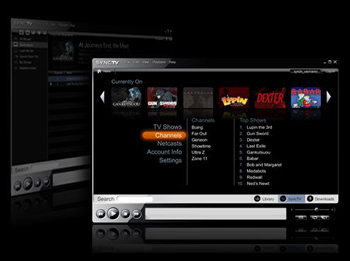 SyncTV will allow people to subscribe to a specific channel and download any program from it. Pioneer, a Japanese consumer electronics company best known for audio products, was initially behind SyncTV, which it spun off on its own in August. Unfortunately, SyncTV has not provided a channel lineup yet, except to say that Showtime is participating. In fact, SyncTV is rather vague about all of its plans. The service will provide access to content from computers, set-top boxes, game consoles, and other consumer electronic devices, even specially-equipped TV sets. But no more detail is available. Same for portable devices. SyncTV is said to work with portable devices, but which ones? All we know is that the service will not work with Apple’s line of iPod products. No surprise there. SyncTV, which will make third-party products available in the first half of 2008, will use the Marlin digital rights management system to stop programs from being copied and played elsewhere. The system, which allows playback on several different devices in the home, works on both Windows and Mac computers. SyncTV sounds interesting. I love the a la carte approach. But now my head is spinning. I no longer know where the best places are to watch the TV shows I miss. There’s Hulu. NBC Direct. The ABC, CBS, Fox, and CW network streaming sites. iTunes. Unbox. Joost. The Internet. And now in January, SyncTV. Sounds pretty good to me. Will be less expensive than buying a season off iTunes. I don’t care what channel has a particular show, and most of the time I don’t even know. I would love to cancel cable.